Delivering a Howard Zinn lecture is a bittersweet experience for me. I regret that he’s not here to take part in and invigorate a movement that would have been the dream of his life. Indeed, he laid a lot of the groundwork for it. If the bonds and associations being established in these remarkable events can be sustained through a long, hard period ahead – victories don’t come quickly – the Occupy protests could mark a significant moment in American history. I’ve never seen anything quite like the Occupy movement in scale and character, here and worldwide. The Occupy outposts are trying to create cooperative communities that just might be the basis for the kinds of lasting organizations necessary to overcome the barriers ahead and the backlash that’s already coming. That the Occupy movement is unprecedented seems appropriate because this is an unprecedented era, not just at this moment but since the 1970s. The 1970s marked a turning point for the United States. Since the country began, it had been a developing society, not always in very pretty ways, but with general progress toward industrialization and wealth. Even in dark times, the expectation was that the progress would continue. I’m just old enough to remember the Great Depression. By the mid-1930s, even though the situation was objectively much harsher than today, the spirit was quite different. A militant labor movement was organizing – the CIO (Congress of Industrial Organizations) and others – and workers were staging sit-down strikes, just one step from taking over the factories and running them themselves. Under popular pressure, New Deal legislation was passed. The prevailing sense was that we would get out of the hard times. Now there’s a sense of hopelessness, sometimes despair. This is quite new in our history. During the 1930s, working people could anticipate that the jobs would come back. Today, if you’re a worker in manufacturing, with unemployment practically at Depression levels, you know that those jobs may be gone forever if current policies persist. That change in the American outlook has evolved since the 1970s. In a reversal, several centuries of industrialization turned to de-industrialization. Of course manufacturing continued, but overseas – very profitable, though harmful to the workforce. The economy shifted to financialization. Financial institutions expanded enormously. A vicious cycle between finance and politics accelerated. Increasingly, wealth concentrated in the financial sector. Politicians, faced with the rising cost of campaigns, were driven ever deeper into the pockets of wealthy backers. And the politicians rewarded them with policies favorable to Wall Street: deregulation, tax changes, relaxation of rules of corporate governance, which intensified the vicious cycle. Collapse was inevitable. In 2008, the government once again came to the rescue of Wall Street firms presumably too big to fail, with leaders too big to jail. Today, for the one-tenth of 1 percent of the population who benefited most from these decades of greed and deceit, everything is fine. In 2005, Citigroup – which, by the way, has repeatedly been saved by government bailouts – saw the wealthy as a growth opportunity. The bank released a brochure for investors that urged them to put their money into something called the Plutonomy Index, which identified stocks in companies that cater to the luxury market. As for the non-rich, they’re sometimes called the precariat – people who live a precarious existence at the periphery of society. The “periphery,” however, has become a substantial proportion of the population in the U.S. and elsewhere. So we have the plutonomy and the precariat: the 1 percent and the 99 percent, as Occupy sees it – not literal numbers, but the right picture. The historic reversal in people’s confidence about the future is a reflection of tendencies that could become irreversible. 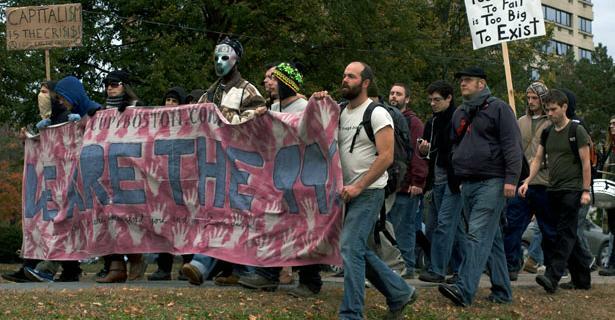 The Occupy protests are the first major popular reaction that could change the dynamic. I’ve kept to domestic issues. But two dangerous developments in the international arena overshadow everything else. For the first time in human history, there are real threats to the survival of the human species. Since 1945 we have had nuclear weapons, and it seems a miracle we have survived them. But policies of the Obama administration and its allies are encouraging escalation. The other threat, of course, is environmental catastrophe. Practically every country in the world is taking at least halting steps to do something about it. The United States is taking steps backward. A propaganda system, openly acknowledged by the business community, declares that climate change is all a liberal hoax: Why pay attention to these scientists? If this intransigence continues in the richest, most powerful country in the world, the catastrophe won’t be averted. Something must be done in a disciplined, sustained way, and soon. It won’t be easy to proceed. There will be hardships and failures – it’s inevitable. But unless the process that’s taking place here and elsewhere in the country and around the world continues to grow and becomes a major force in society and politics, the chances for a decent future are bleak. You can’t achieve significant initiatives without a large, active, popular base. It’s necessary to get out into the country and help people understand what the Occupy movement is about – what they themselves can do, and what the consequences are of not doing anything. Organizing such a base involves education and activism. Education doesn’t mean telling people what to believe – it means learning from them and with them. Karl Marx said, “The task is not just to understand the world but to change it.” A variant to keep in mind is that if you want to change the world you’d better try to understand it. That doesn’t mean listening to a talk or reading a book, though that’s helpful sometimes. You learn from participating. You learn from others. You learn from the people you’re trying to organize. We all have to gain the understanding and the experience to formulate and implement ideas. The most exciting aspect of the Occupy movement is the construction of the linkages that are taking place all over. If they can be sustained and expanded, Occupy can lead to dedicated efforts to set society on a more humane course. 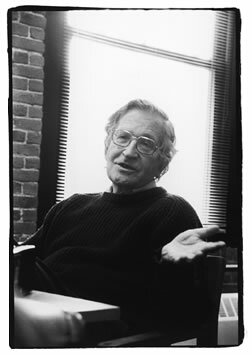 About Noam Chomsky: Noam is Institute Professor & Professor of Linguistics (Emeritus) at the Massachusetts Institute of Technology, and the author of dozens of books on U.S. foreign policy. 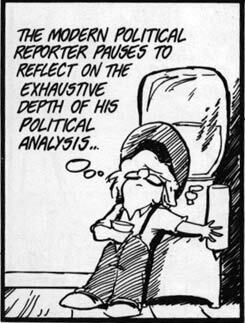 He writes a monthly column for The New York Times News Service/Syndicate. This is a re-post of the complete article, which is available at: In These Times website and Noam Chomsky’s website.